This week, the ladies of Rugby Golf Club held their annual presentation evening – gathering together to celebrate the achievements of the members of the section during the past year. The photograph (above) features this year’s winners of the many and various competitive events held each year by the RGC Ladies’ Section. The winner of the most prestigious competition of the season, the 36-hole Championship event, was Abi Mortimer-Lane, who also won the Handicap Cup. Other awards went to individuals such as Sue Jones who, over the season, achieved a magnificent number of birdies – and to Linda Long who excelled in the number of pars that she scored. Also receiving recognition were individuals like Pam Bond who won the Vets’ Cup and Robyn Crighton who won the Grannies’ Shield. Team performers Sue Jones and Deb Harrad clearly demonstrate that golf doesn’t have to be an individual sport. 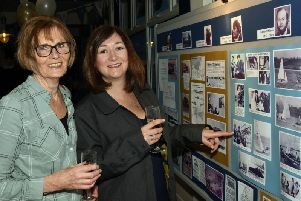 However, as the Ladies’ Captain Anne Hawkins was keen to point out, the achievements of all the members of the RGC Ladies’ Section are not confined to those receiving awards on this particular evening of the year. Ladies of the RGC Section, players or non-players, achieve in so many and varied ways – they are all ‘winners’. In golf terms, any player will tell you that a drive into a particularly nasty bunker, with no obvious alternative route out but a full-on attack on the ball (apparently an impossible shot) but one which ends up ‘in the hole’ and a Birdie score, is what keeps a golfer playing. Was it luck or skill? Who knows? – but it was still a significantly memorable achievement!